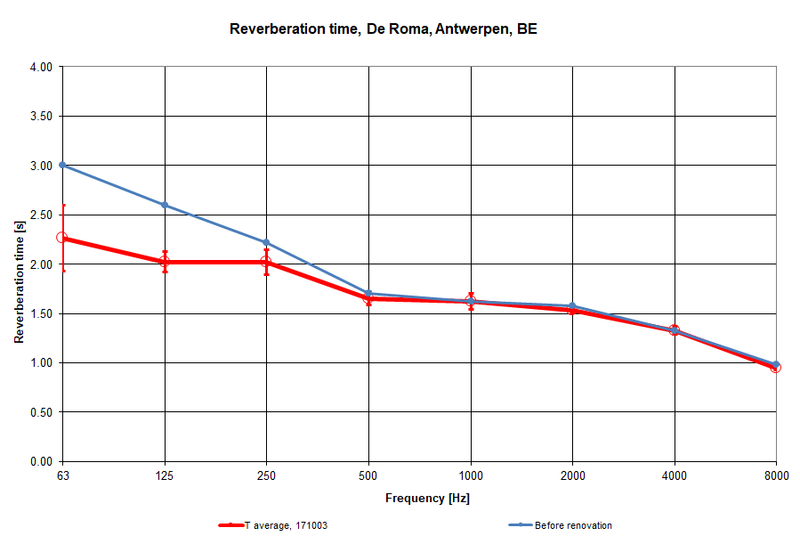 During the summer of 2017, we took the time to improve both the PA system and the acoustic qualities of concert venue De Roma in Borgerhout (Antwerp). It couldn’t be done by half measures. 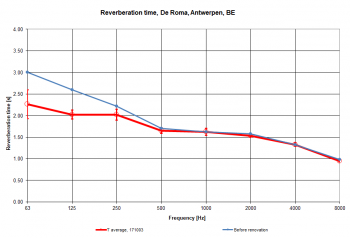 Sound amplification and acoustics go hand in hand and therefore you need a plan. That’s why De Roma joined forces with Amptec and ShowTex. Amptec consulted a foreign acoustical expert, Eddy Bøgh Brixen. It was with Eddy’s recommendations that ShowTex started working. Based upon the measurement report and considering the unique character of the room, the acoustics were fine-tuned, avoiding flutter, undesired reflections and long reverberations. The most important thing was to come up with an acoustic solution that would not hamper the romantic elements of the hall. De Roma is a classified building, so all implementations had to be carried out with the greatest respect for the hall’s original style. Recycled cotton was fixed to the rear walls of the balcony and the former projection room. This eco-friendly product by Showtex is made of tissue remnants. The original walls were photographed with great detail and then digitally printed on a huge apparently seamless canvas of 18 by 3 metres, to pack the walls with a natural looking replica. "The iconic ornaments were replaced and in combination with the perfect lighting, they provide an invisible acoustic solution." An acoustic treatment of the ceiling seemed a step too far due to so many restrictions, but ShowTex developed a custom solution for the hall. Two giant inflatable shells in the shape of the existing dome, made of specially coated woollen textiles were installed. The shells are continuously inflated during concerts acting as absorbent membranes. The big hollow dome became a spherical dome that resolves the flutter problem. "An absolute first for a Belgian concert hall."